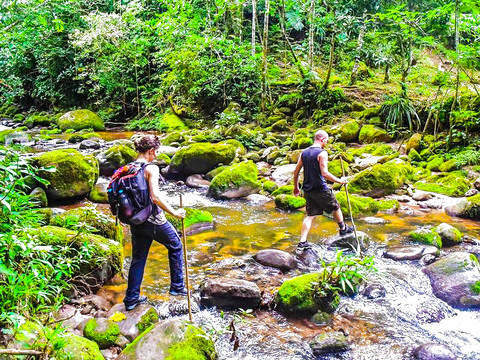 Get to know the best of the Amazon rainforest in a short time! One of the best wildlife viewing spots at your fingertips. Browse the Amazon River, Natural Wonder as the longest and largest river in the world. 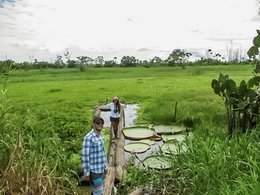 Visit to the Tamshiyacu Tahuayo Community Reserve, one of the best spots in the Peruvian Amazon to observe wildlife in its natural habitat. Enjoy the comfort of the hostel and private rooms of Curassow Amazon Lodge. 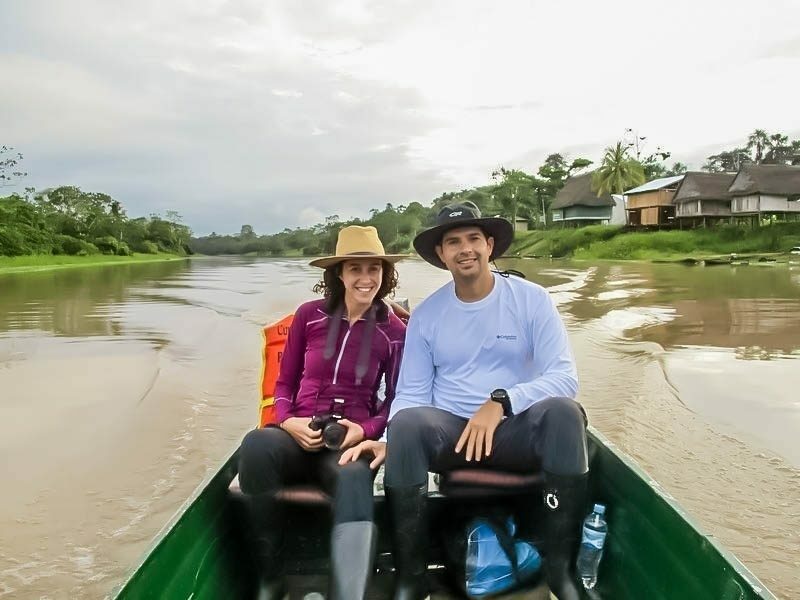 Experience day and night activities, on foot or in boat in the middle of the jungle to observe pink dolphins, gray dolphins, monkeys, sloths, caimans, rodents, tarantulas, toads, snakes, mammals and more species of the Amazon. Iquitos: Pick up at Hotel or Airport. Confirm collection point and / or data of your hotel in Iquitos at least 1 day in advance. 9:30 am - Pick up from the Hotel or Airport to the port of the city of Iquitos. Navigation 3 ½ hrs. by the Amazon River. Exotic welcome refreshment, accommodation in private bungalows. 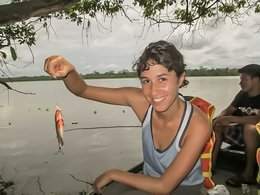 Boat trip to "Corriente" - "Purura" area, piranha fishing and observation of Shansho (prehistoric bird). Night boat excursion to observe alligators, birds, mammals, among other nocturnal species. 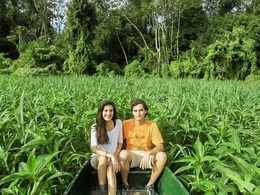 Exploration by boat and walk in the jungle. Breakfast on board on the waters of the Amazon River to swim in waters where the dolphins live. Observation of iguanas and the largest aquatic plant in the world (Victoria Regia) and visit the town to know their customs / handicraft shows. 1:30 pm - Farewell tour at Curassow Amazon Lodge. 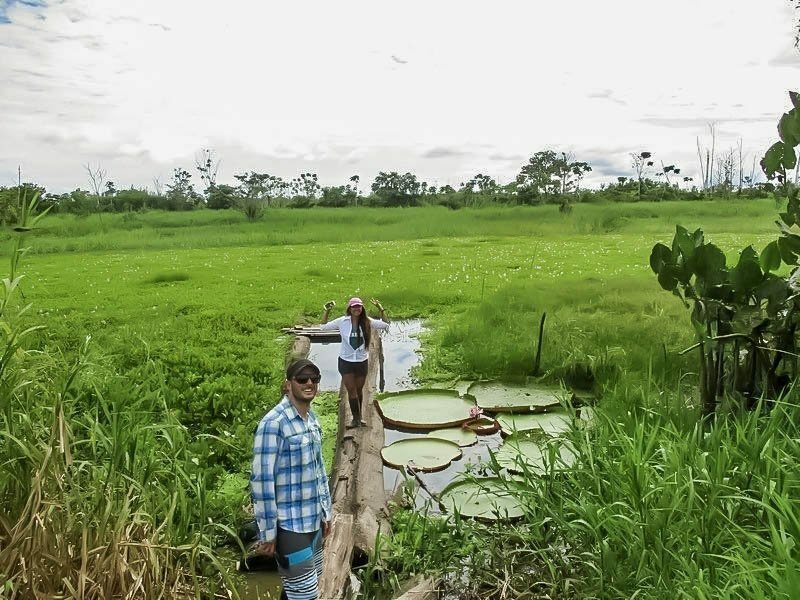 Navigation through the Amazon River to return to the city of Iquitos-Airport-Hotel. 5:00 pm - Approximate arrival at the hotel or airport of Iquitos. Private fast boat round trip from Iquitos to the lodge. Private bungalow (room), with complete bathroom and terrace with hammock overlooking the river or the jungle. Complete meals: Breakfast, lunch and dinner. Water to drink, fruits, coffee, tea and milk 24 hours. Activities and excursions indicated in the program. Day and night excursions in search of animals. Bilingual naturalist guides (Spanish / English). Amenities: Shampoo and toilet soap. Board games (Monopoly, Scrabble, Chess, etc). Solar electricity for the recharge of batteries of cameras and laptop in established schedules. First aid kit and antiofidic serum. Discount at hotel Emperador Terraza de Iquitos. Consumption of the bar (liqueurs and snacks). Laundry (can be washed coordinating with the Administration). Children under 4 years, FREE in room with parents. Children from 4 to 12 years old pay 50% of the rate. Children will be entitled to the discount only if they are accompanied by 2 adults. After making the reservation, you must indicate your itinerary for arrival and departure flights from Iquitos (dates, airline and flight number), your hotel in Iquitos (if you have one), your diet (normal, vegetarian, strict vegan, special, others), allergies to food and / or medicines, as well as emergency contact. 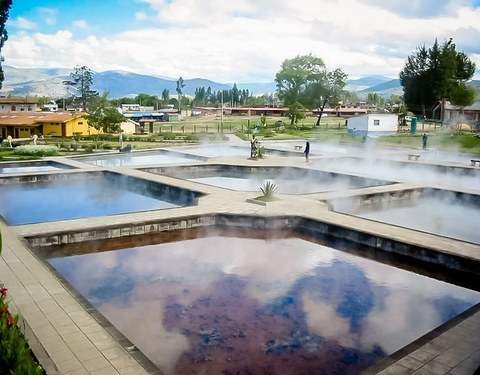 The schedules and order of the activities can vary according to the climatic conditions or other relevant reasons to guarantee the best experience of the traveler. 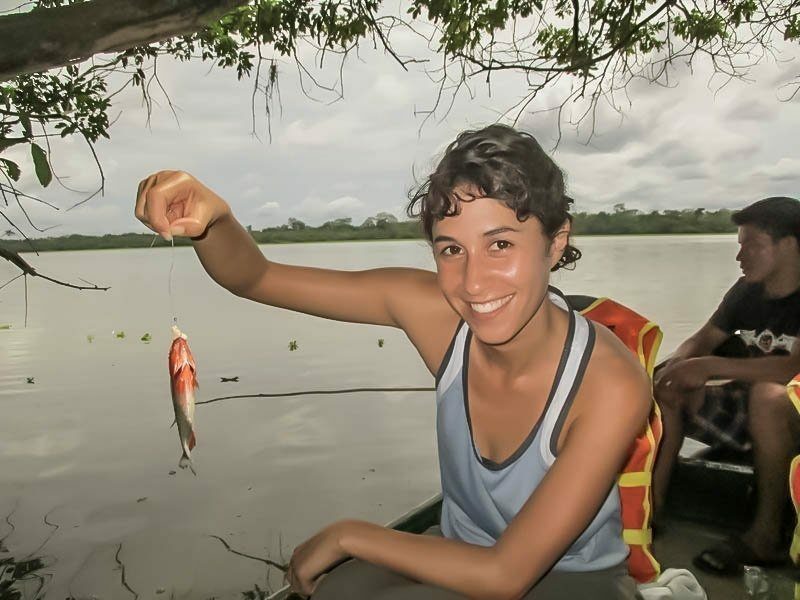 To guarantee wildlife observation and stay in a virgin jungle area, our hostel is located in the Tamshiyacu Tahuayo Reserve, 3 hours by quick boat from Iquitos. You can only reach our lodge with our private transport, there are no public transport that go our route. This nature reserve is much less visited by tourists compared to the Pacaya Samiria Reserve. 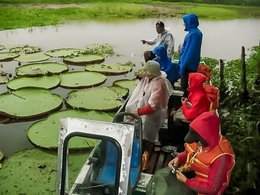 Our quick boat leaves from Iquitos every day at 9:30 am. To return to the city, we leave the EcoLodge after lunch (approx 1:00 pm) and arrive in Iquitos or the airport at approximately 5:00 pm. 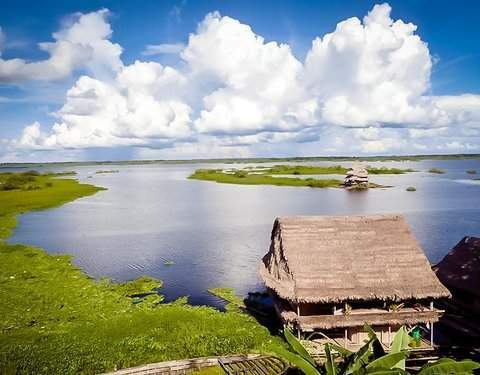 Therefore, you must arrive in Iquitos one day prior to the start of the tour and take the return flight on the same day of the end of the tour, with departure time later than 8 pm (20 hr), or a day later. If you arrive the same day of the beginning, you must arrive before 8:30 am. If the itinerary of your flights does not match our schedules, you must indicate before booking to find alternatives, such as see the option to schedule the departure of our transport after 9:30 AM. Curassow Amazon Lodge is not responsible for not being on time at the port due to delays in its flight or transportation used by the traveler to reach Iquitos. If we lose our fast transport, a new boat with the address to the lodge will have an additional cost of S / 650 Soles per boat per section. Sandals to be inside the EcoLodge. Long cotton socks for use with jebe boots. Long trousers for walking in the jungle. They serve as protection against mosquito bites. Cool shirts or polos long sleeve, cotton and light colors. Camera and / or camcorder (minimum ISO 400/27 for camcorders), sufficient memory cards and charger (we have solar electricity). Airtight bag to protect cameras and equipment from moisture. Mosquito repellent with at least 25% DEET. Sun block with SPF 25 to 40. Preferably water resistant and unscented. It should be applied 30 min before sun exposure and renew every 2 hours. A bottle for water or canteen. Rain poncho and wide-brimmed hat. A small backpack or kangaroo to carry repellent, water and others during excursions. Optional: Binoculars, Flashlight or head lamp. Better if it is solar or rechargeable, not to use contaminating batteries. Optional: Sunglasses with UV protection. Space in the boat is limited. We suggest carrying only what is necessary to the jungle. You can store excess baggage at the offices of Curassow Amazon Lodge in Iquitos. In addition, in the excursions, we optionally visit a coastal town to observe their way of life and acquire handicrafts. If you like, you can bring school supplies, clothes, small toys, etc. to donate them voluntarily to children in the area. We do not suggest candy because medical-dental care is virtually non-existent in jungle communities. Curassow Amazon Lodge is a rustic lodge located on the banks of a stream of the Amazon River, in the virgin jungle adjacent to the Tamshiyacu Tahuayo Community Reserve, one of the most diverse places of mammals, primates, amphibians, reptiles, birds and trees of the world according to studies of the Chicago Field Museum of the United States. 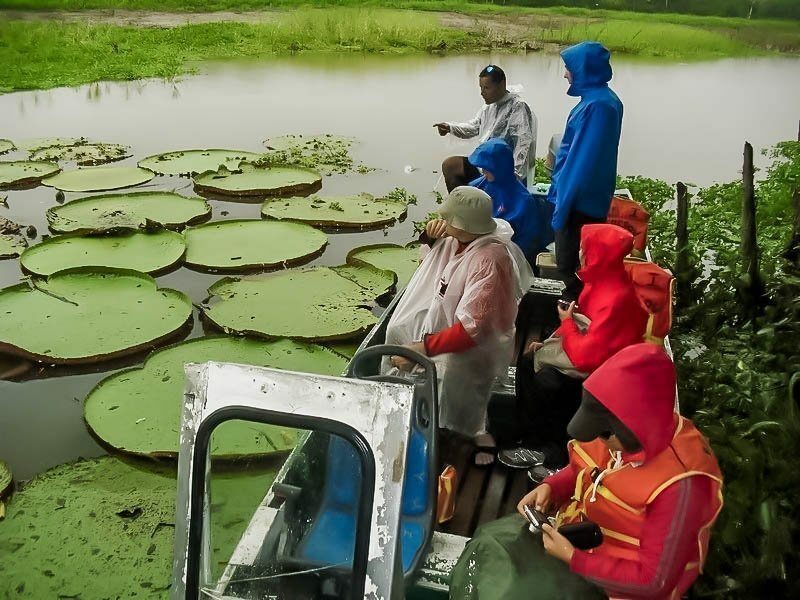 Its location in a protected area, 100 km (62 mi) or 3 hours by quick boat allows to guarantee the observation of fauna in its natural habitat, something impossible on excursions around Iquitos. Some of the most frequent species are pink dolphins, gray dolphins, lazy bears, alligators, monkeys, frogs and a great variety of birds, insects and reptiles. Curassow Amazon Lodge offers 10 private cabins (rooms or bungalows) each with its own bathroom, shower and fresh water 24 hours, from where you can enjoy the view and the sounds of the Amazon. The EcoLodge, committed to nature, has solar panels to provide electricity to recharge batteries and for Led spotlights that illuminate the rooms and facilities. It offers an "All Inclusive" service: The rates include breakfast, lunch and dinner, activities led by expert naturalist guides, fishing, day and night tours of the river and jungle ideal for observing flora and wildlife in their natural habitat.